Two Twin Cities projects built by Kraus-Anderson earned Awards of Excellence from the Minnesota Construction Association (MCA) at its annual gala January 25, 2017. The company received honors for: Chaska Firemen’s Park Curling and Event Center in Chaska; and T3 (Timber, Transit and Technology) office building in Minneapolis. The seven-story, 258,816 s.f. T3 (Timber, Transit and Technology) office building located at 323 North Washington Ave. in the Minneapolis North Loop is a milestone in contemporary office architecture. 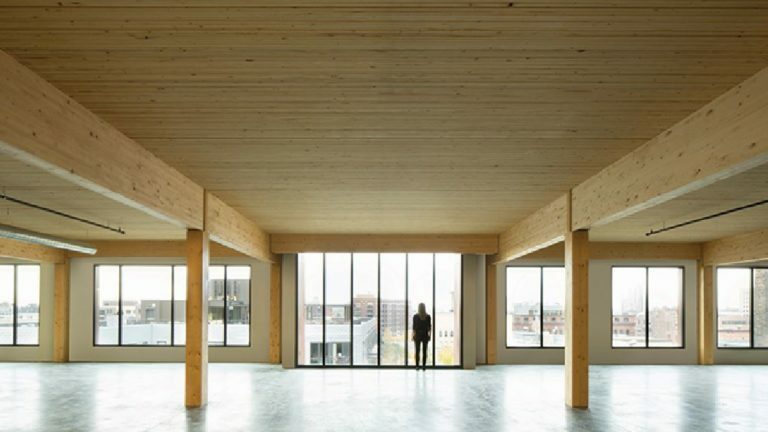 T3 is the largest mass timber building in the U.S. and the first commercial property in the nation to utilize an engineered wood material for its structure and interior. The building is developed by Houston-based Hines and designed by Vancouver-based Michael Green Architecture, in conjunction with Minneapolis-based DLR Group. Michael Green Architecture is among the world’s foremost experts in heavy timber construction and an advocate for timber as a sustainable building material. 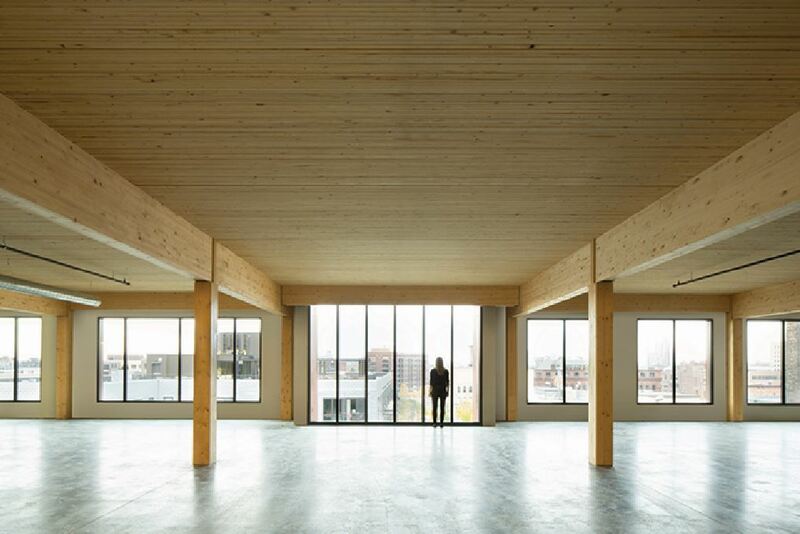 While old-growth timber — the kind required to support the weight of a tall building — is unavailable for construction today, an engineering process that presses smaller pieces of wood together can recreate the load capacity of heavy timber. The building replicates the character and aesthetics of the historic structures in its Minneapolis North Loop neighborhood, with features including Weathering Steel exterior cladding, 11-foot exposed timber ceilings, industrial-influenced windows, rooftop deck, fitness center, underground heated parking and 100 bike parking spots. T3 is adjacent to bike trails and one block walk to LRT, commuter rail and metro transit buses. Located at 3210 Chaska Blvd. in Chaska, on the site of a former brick factory, Chaska Firemen’s Park Curling and Event Center construction and renovation project ushers in new excitement to the community, while honoring its history. The unique municipal redevelopment includes the new 42,497-square-foot Chaska Curling Center, Welcome Hall and Crooked Pint Ale House restaurant. The curling center includes six curling lanes, locker rooms, and tiered seating, with viewing tables inside the ale house. The facility will also include a 300-seat event center, now nearing completion, with patio and two outdoor venues for weddings. A new boardwalk encircles Fireman’s Lake and a pedestrian bridge crosses the lake. Construction features also include beach area improvements, new park shelters, stage pavilion, interactive fountain, memorial walk and updated playground. In addition to the Awards of Excellence winners, three KA projects were recognized with Merit Awards for Ebenezer Tower Apartments; New Ulm High School and the University of Minnesota Bee and Pollinator lab. The Minnesota Construction Association is a non-profit organization that provides networking, recognition, and education opportunities for construction managers, project managers, general contractors, subcontractors, owners, engineers, architects, attorneys, suppliers, developers, educators and students involved in the construction industry.